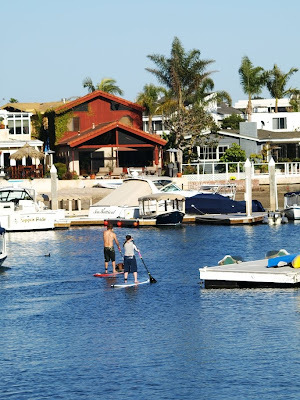 The Gondola Blog: Surfers acting like gondoliers? I spotted these two this afternoon on the canals in Newport. I’ve seen this sport before, and of course the immediate reaction is to compare them to Venetian rowers. The truth is that it’s a trend popular with many surfers these days. 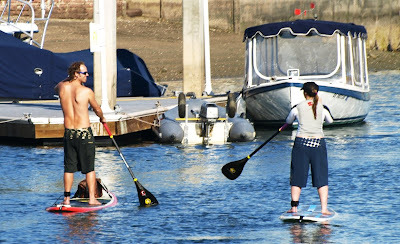 It’s called Stand Up Paddle Surfing, or “SUP”. It’s been around since the early 60’s when guys in Hawaii in would paddle around on their longboards using outrigger paddles, but it made a big comeback recently as surfers like Laird Hamilton saw the benefits of a higher point of reference. When Nereo Zane and his family were out from Italy in September, he and I met with some of my gondoliers who are also surf instructors. While we were surfing there was a guy out paddling one of these things. The board is much more buoyant and the process of catching a wave is a little different, but they ride pretty much the same…or so I’m told. I’ve never surfed on one or tried the standing up and paddling approach quite like that. Obviously there’s no forcola, and it’s a board rather than a boat, but the folks who do it appear to enjoy the advantages of standing up and facing forward. Another reason for the popularity of SUP is that you can do it just about anywhere, regardless of whether or not there are waves.